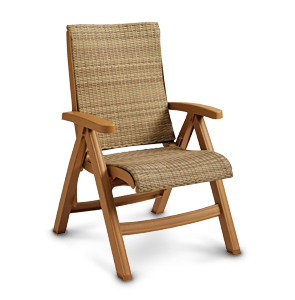 The Java All-Weather Wicker Folding Chairs add a sophisticated touch to your outdoor area. 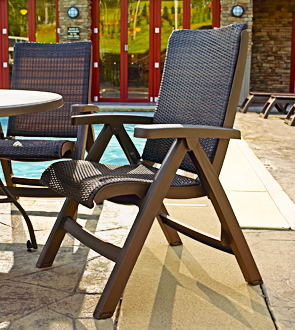 The high strength VIRO® resin wicker fiber back and seat is highly flexible for comfort, and is resistant to color fading, cracking, peeling, and breaking. The chairs conveniently fold up for easy transportation and storage. The resin wicker fiber is specifically woven to create a breathable surface in commercial outdoor environments and can be power washed when needed. The folding chair frames are constructed of 100% first quality UV stabilized resin that is naturally resistant to salt, air, and most stains. Java chairs are available in Espresso/Bronze Mist and Honey/Teakwood combinations to match your environment. Seat height is 18-1/2".